A group of artists in Santa Fe, NM, frustrated by the lack of access to the art world, decide to form their own collective and name themselves Meow Wolf. Their immersive, large-scale exhibitions crack open a profitable niche in the arts industry, and they spark the interest of George R. R. Martin (creator of "Game of Thrones,") who comes on board as an investor and supporter. 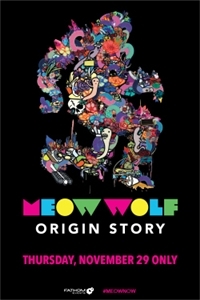 With their wild success obtained on their own terms, Meow Wolf tells its own story and inspires the DIY spirit in creatives, entrepreneurs, and dreamers the world over - in cinemas for one night on Thursday, November 29 only at 7:30 p.m. local time.